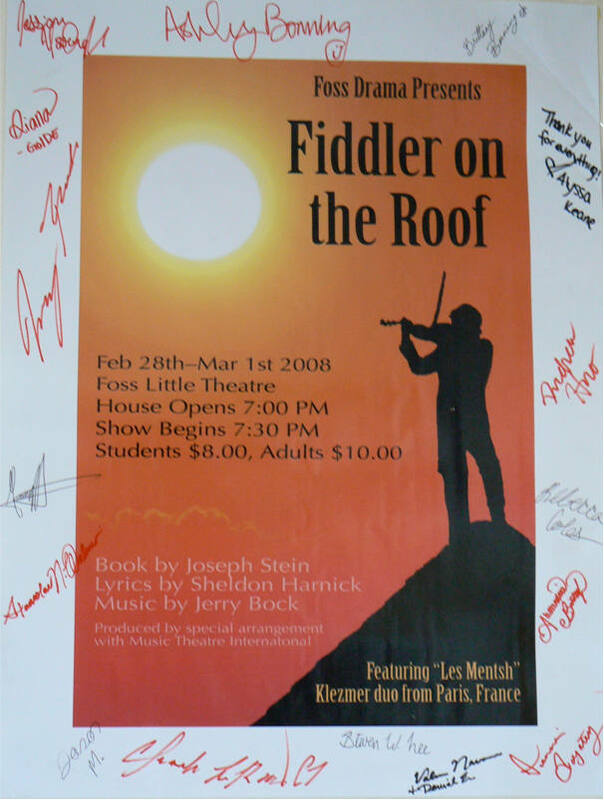 A fiddler on the roof is a famous musical comedy created on Broadway in 1964 by Joseph Stein who adapted it from a short story by Shalom Aleichem. The music was by Jerry Bock and the lyrics by Sheldon Harnick. At the beginning of the 20th century in Anatevka, a Small village in the Ukraine. Life was organised according to the traditions established for a long time by the christian orthodox community as well as the jewish community who got along very well without mixing. The village milkman tevye a basically good person who leads a modest existence with his family wishes to marry his two eldest daughters Tzeitel and Hodel. In order to do so he has to negotiate with his wife and take some liberties with his religion. Since Tzeitel who is promissed to Lazar a rich butcher, who would prefer to marry Motel, a poor tailor. Hodel was proposed to by Perchik a student from Kiev who joined a marxist group after hearing the first rumors of a pogrom in the region. Already shaken up, Tevye’s tolérance is stretched by his third daughter Chava who announces her intention to marry a non jewish person the young russian Fyedka. The milkman tries his best to get out of this délicate situation when a decree by the tsar orders jews to leave the village, condemning his family to exile and dispersion. The Mentsh had the great pleasure and privilege of participating and co-directing this musical comedy Fiddler on the Roof. This in direct collaboration with the doctor Valery Navarro from the Henry Foss High school of Tacoma. Some of the pupils were very poor, others were children of first generation immigrants and the work we did together certainly was a helping factor of their integration. None of the troop’s members was jewish. However as the work progressed the students interest and their involvement increased in the artistic endeavor as well as their curiosity for the historical research we exposed them to. We also explained how the rhythm of the week was organised around the Shabbes and the rules. We also showed them how not so very long ago (less than one century) weddings were arranged. We also helped them to understand the depth of the emotional wounds of the pogroms and the Shoah. The emotion was at its pinnacle on the second night which coincided with the announcement of the great actor Ivan Rebroff’s death. This unique moment allowed us to understand the importance of the continuation between generations of performers. Finally when an artist dies the new génération must be capable of continuing.